Last newsletter we told you about our report on solutions to reduce marine plastic pollution. This is still a live issue as we investigate ways to bring attention to the problem and implement solutions. In March, there are two events to advance this topic. 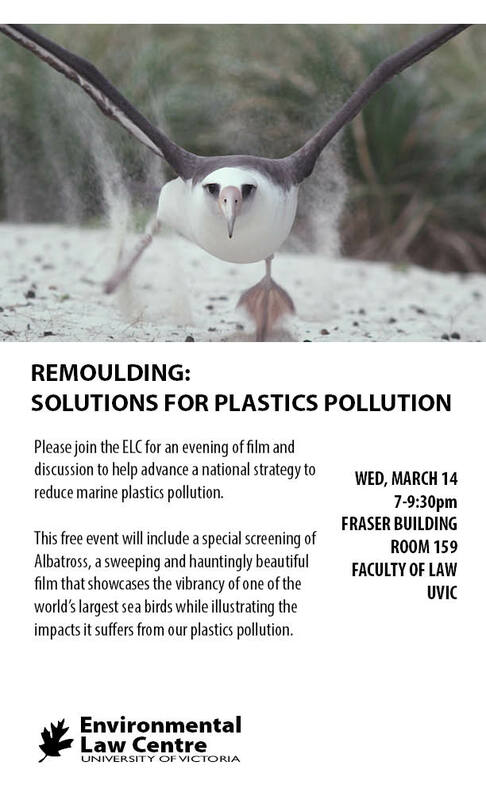 On March 14, the ELC Centre and Club are co-hosting a special event to screen the new documentary Albatross, to share our work to-date on the issue, and to generate a discussion about how to advance a national strategy to address marine plastics pollution. This event is open to the public and we invite you to attend and be part of the conversation. We are optimistic about the idea of a national strategy gaining traction with the federal government, particularly considering their announcement that they are bringing the issue of marine plastics to the G7 meeting in Charrlevoix, Quebec this June. The Deputy Minister of Environment Canada invited Calvin to the “Leaders and Experts Roundtable” to help develop Canada’s position. Meanwhile, ELC students continue work on MP Gord John’s private member’s bill to establish a national marine plastics strategy. We will report on our progress and any new developments on this issue in our next newsletter. Please join us for an evening of film and discussion to help advance a national strategy to reduce marine plastics pollution. In addition to the film screening and Q&A, the ELC will discuss our work on marine plastics pollution and will generate a conversation aimed at a national strategy to reduce marine plastics pollution. On a remote atoll in the North Pacific Ocean, albatross chicks are dying, bodies filled with plastic. ALBATROSS unflinchingly shows the horror and grief of this tragedy, but ultimately brings you to a deeply felt experience of beauty and love for life on Earth. 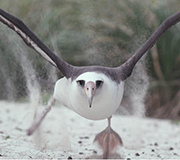 Stepping outside of traditional documentary film style, ALBATROSS delivers a profound message of reverence and renewal. Marine debris is a global problem that has no simple solu­tion and continues to impact water quality, harm aquatic ecosystems, and degrade the aesthetic appeal of marine and freshwater areas. Many previous and ongoing efforts to control and clean-up marine debris focus on single sources of pollution. However, there is need to develop collabora­tive approaches, targeted to specific geographical locations, that connect on-land and ocean-based sources to effectively control plastic pollution. To do so, Duke Law’s Environmen­tal Law & Policy Clinic and the Environmental Law Centre at the University of Victoria have developed holistic strate­gies that utilize legal, regulatory, economic, and scientific tools to address the sources and impacts of marine debris. Through this work, our teams have developed best manage­ment practices for building functional networks that connect municipalities, regulators, and non-profit organizations both inland and along the coast, with the goal of promoting effec­tive solutions to the marine debris problem.